Neel Kashkari participated in a Q&A in Bethel’s Underground moderated by Professor of Economics Tim Essenburg on October 11. 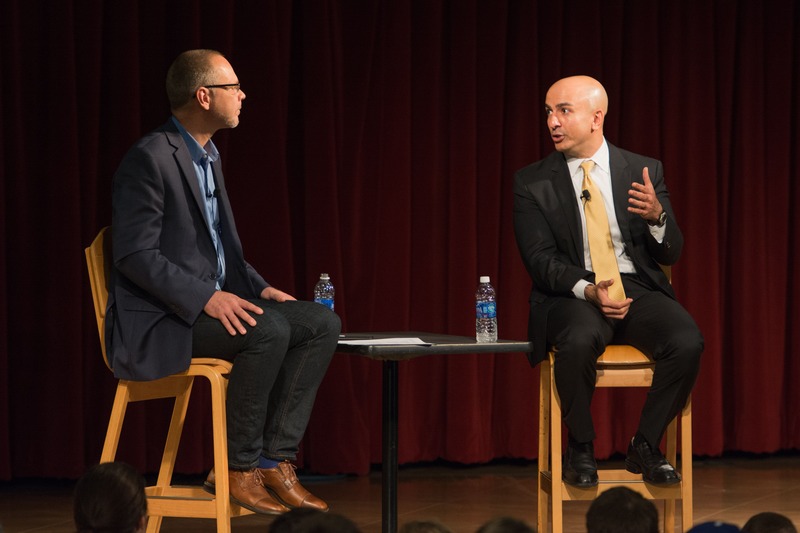 President and CEO of the Federal Reserve Bank of Minneapolis Neel Kashkari joined Bethel Professor of Economics Tim Essenburg for a Q&A session on the Underground stage in front of a packed crowd of students, staff, and faculty. 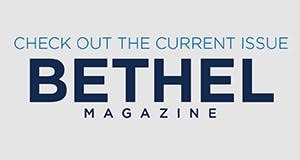 The visit has garnered widespread media attention, earning Bethel a mention in The New York Times DealBook newsletter, among other major news outlets. Dean Junkans, an adjunct professor in the Department of Business and Economics, was the primary coordinator for the event. “Personally, I think that the more we can expose students to key public or private figures in areas they are learning about in the classroom, the more we will help them bring the subject area to life,” he says. In his previous role as chief investment officer for wealth, brokerage, and retirement at Wells Fargo, Junkans had encountered Kashkari—who was also working in the private sector—on numerous occasions, and so he thought to reach out to him about speaking on campus. “He’s the only Minneapolis Fed president who has shown interest in engaging with the community,” Junkans says, going on to explain how Kashkari’s experience with both public service and private business gave him a well-rounded perspective that was beneficial in helping students “connect the dots” with their studies. And ultimately, he hopes that his coming proposal, set to be released before the end of this year, will be just the thing to make a difference. Since entering his current role, Kashkari has taken a stance against banks that are too big to fail—or so large that the economy depends on their success. And though he recognizes that “sometimes things take a long time before they take a short time,” he remains hopeful that “people will pay attention” to the Fed’s recommendations. Watch the full video of the event on the Federal Reserve Bank of Minneapolis website.